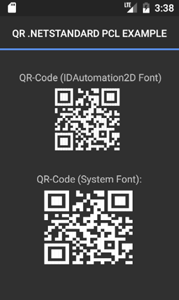 Introducing the Xamarin .NET Standard PCL QR-Code Generator which is a Multi-Platform .NET Standard Library to create QR Code Barcodes on iOS, Android, Windows and Mac devices that support .NET Standard 1.0. 1. Digitally signed and compiled .NET Standard PCL. To buy now, visit https://www.idautomation.com/cart/IDAutomation-QR-Code-Xamarin-Compatible-NET-Standard-PCL-P12501.aspx.